At 12:30 am on Friday morning, January 24, a convoy of pilot and flagger vehicles, state, county, and city police escorts, and a 804,000-pound transport of tar sands mining equipment hauled by Portland, Oregon area-based Omega Morgan hesitantly rolled down Reserve Street in Missoula, Montana, and ground to a halt. For a third night, about sixty mostly indigenous people from Missoula, Butte, Helena, and all over Montana and Canada sprang from the sidewalk near Central Avenue and filled the five-lane width of Reserve Street with singing, drumming, and round dancing. Police respectfully backed off and stood by, letting the ceremony symbolizing solidarity and friendship continue for 10 to 15 minutes, while dozens of the vehicles and workers facilitating ecocide, genocide, and climate chaos idled all around the beautiful circle. Together with the spirits of the Earth, ancestors, and elders, the strong prayers and actions of the Salish, Cree, Anishinabe, Blackfeet, and Cheyenne people who participated in person or from afar impressed everyone who heard the songs and watched the round dance. A handful of drummers and singers – Amanda, Charles, Lionel, Q.J., and others – led two rounds of dancing around them, before the joyous blockaders slowly vacated the street. A smaller and faster mystery megaload, transported by Action Specialized of Lynden, Washington, on the same route as the Omega Morgan-hauled loads, moved on Wednesday night, January 22-23, from Lolo through Missoula to the Bonner Town Pump Truck Plaza by early Thursday morning. * Because it is also headed to Alberta to expand tar sands mining, eight brave protesters, including three drummers and two children, staged an action to temporarily halt the destruction of boreal forests and bogs and indigenous life ways and health that this ‘mini-megaload’ will impose. With only one Missoula police car in sight and both lanes of Reserve Street open to regular traffic, the tribal and climate activists stopped vehicles with the street light for the Reserve Street crosswalk between Central and Kent Streets, near C.S. Porter Middle School. At about 12:30 am, the megaload convoy was traveling slightly slower than the normal speed of about 40 miles per hour, as the front pilot vehicles paused and the following oversize transport without highway patrol escorts slowed down almost to a stop. Instead of dangerously spreading across the five-lane street to block all traffic, the eight protesters prepared to round dance on one side of the road. Suddenly, the evaporator, about a third of the size of the Omega Morgan cargoes, drove around the blockade into the oncoming traffic lanes! Police cars with flashing lights passed after the overlegal load and support vehicles, skirting the swiftly unfolding scene where no one was injured or arrested. 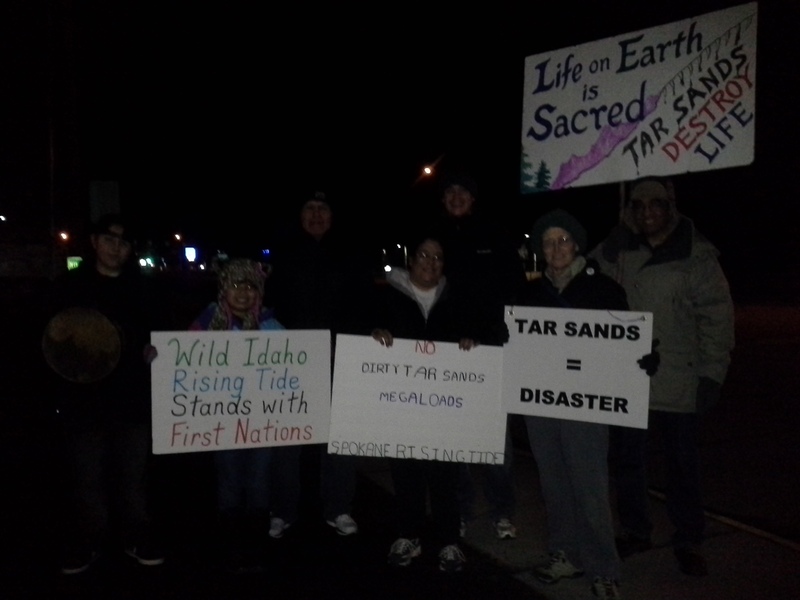 Montana, Idaho, and Washington tribal and climate activists are meeting again for two more Missoula tar sands megaload protests at the Rosauers at Reserve and South Streets, at 12 midnight on Wednesday/Thursday, January 22-23, and Thursday/Friday, January 23-24! Montana Indian Peoples Action, along with Blue Skies Campaign, Northern Rockies Rising Tide, Spokane Rising Tide, and Wild Idaho Rising Tide, protested, prayed, and round-danced against a “megaload,” a colossal piece of tar sands processing equipment that Omega Morgan hauled on Reserve Street through Missoula, Montana, on Wednesday morning, January 22 [1-4]. Bringing together residents of Missoula and other communities in Montana, Idaho, and Washington affected by tar sands transportation projects, the approximately 50 protesters stood in solidarity with the Nez Perce and Shoshone-Bannock tribes in Idaho, the Confederated Umatilla and Warm Springs tribes in Oregon, and especially the First Nations people in Canada, who oppose tar sands mining and its pollution and devastation of their ancestral homelands in present-day Alberta. On Sunday afternoon, October 20, three Wild Idaho Rising Tide (WIRT) activists drove by the Port of Wilma, across the Snake River from Clarkston, Washington, where megaload hauler Omega Morgan has leased and secured a yard and warehouse, to store, disassemble, and stage evaporators transported whole up Highway 12 or in pieces up Highway 95 to Alberta tar sands steam assisted gravity drainage mining operations. On Sunday afternoon, October 20, on the way to scout the Port of Wilma, three Wild Idaho Rising Tide (WIRT) activists spotted a megaload with an oversized load banner and Alberta license plates (4MMO-31). The liquid full absorber manufactured by Doosan Heavy Industries Vietnam, on Trail King trailers licensed in Alberta and provided by R & D Trailer Rentals, parked facing downhill (southbound) at the Idaho Transportation Department (ITD) weigh station on the top of the Highway 95 Lewiston grade. The cylindrical module, used to process natural gas or other fossil fuels, measures 15.38 feet wide, 14.64 feet high, and 38.71 to 49.21 feet long, with a gross weight of 64,174 pounds. WIRT documented the equipment specifications with videos and photos. Within the afternoon hour, protestors associated with the activist group, “Idaho Wild Rising Tide”. Were held in the later afternoon hours outside the Idaho Department of Lands in response to a Gas Well lease currently being planned for the Payette Idaho area.